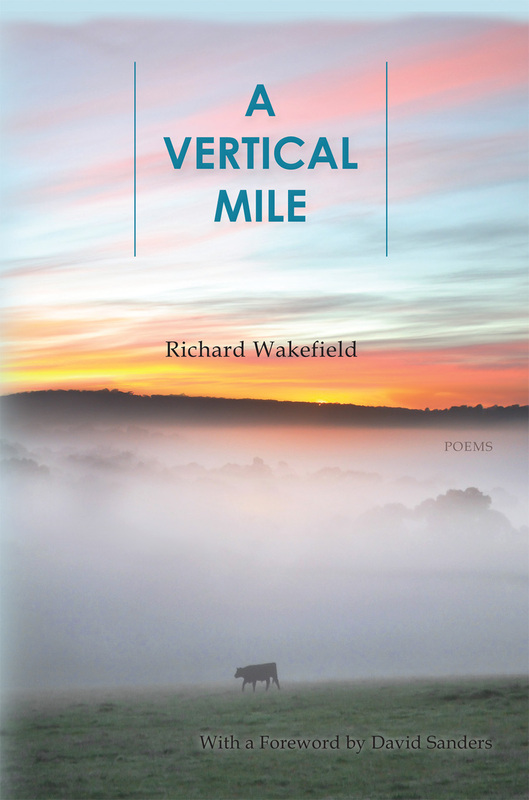 A Vertical Mile from Richard Wakefield is a finalist in the 2011 Able Muse Book Award. Keenly observed themes about people and the land they live in show a profound sense of awe before natural beauty and a love of country life, while recognizing the effect of indifference and inexorable technological advancement. Included are poems about childhood, seasonal changes, mountain climbing, religion and its questions and doubts, life and death, human origins. These poems of stunning artistry show Wakefield in complete command of his craft. This a memorable collection whose insights and pleasures are not to be missed. Deeply rooted in the human history and natural order of his native state, Richard Wakefield’s A Vertical Mile depicts life in rural Washington—people, animals, plants, geological formations, the weather and the seasons. Building on his powerful and impressive first collection East of Early Winter s, Wakefield, in A Vertical Mile , has now firmly established himself as one of America’s foremost formal poets. In their memorable presentation by way of deftly employed narrative, meter, rhyme, metaphor, symbol, and diction, the poems in this new collection, once read, cannot be easily dislodged from the mind. That, in itself, is evidence that Wakefield’s best poems are a permanent addition to American letters. Richard Wakefield crafts his verse to exacting standards yet keeps it uncontrived. Throughout A Vertical Mile,Wakefield shows us much about ourselves and the various worlds we inhabit, often of our own making. What he reveals may be sobering or amusing, uplifting or distressing. But, carried by a voice as versatile as the intelligence behind it, it is sure to surprise and delight us as well. 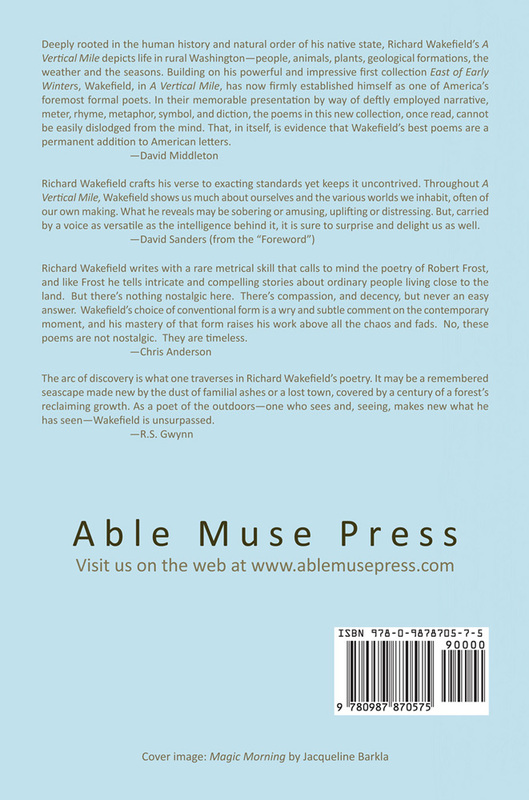 Richard Wakefield writes with a rare metrical skill that calls to mind the poetry of Robert Frost, and like Frost he tells intricate and compelling stories about ordinary people living close to the land. But there’s nothing nostalgic here. There’s compassion, and decency, but never an easy answer. Wakefield’s choice of conventional form is a wry and subtle comment on the contemporary moment, and his mastery of that form raises his work above all the chaos and fads. No, these poems are not nostalgic. They are timeless. The arc of discovery is what one traverses in Richard Wakefield’s poetry. It may be a remembered seascape made new by the dust of familial ashes or a lost town, covered by a century of a forest’s reclaiming growth. As a poet of the outdoors—one who sees and, seeing, makes new what he has seen—Wakefield is unsurpassed. Richard Wakefield , born in Renton, Washington, in 1952, earned his Ph.D. in American Literature at the University of Washington-Seattle with a dissertation on the poetry of Robert Frost. For nearly thirty years he has taught literature and composition at Tacoma Community College and the University of Washington-Tacoma. For over twenty-five years he has been a reviewer of fiction, literature, biography, and literary criticism for the Seattle Times. His poetry collection, East of Early Winters ( University of Evansville Press, 2006), received the Richard Wilbur Award. His poem “Petrarch” won the 2010 Howard Nemerov Sonnet Award. He and his wife, Catherine, have been married thirty-nine years and have two grown daughters.